En-route to Sustainable Employment is a two-year Mayor’s Fund for London project supported by the Joseph Rowntree Foundation. The project provides support for young Londoners (16-24 years old) from Black, Asian, and Minority Ethnic (BAME) backgrounds to get into work and improve awareness of available career progression opportunities. The first year will focus on the transport sector, and will be developed to be replicable across other city regions and sectors to support employers to improve diversity and add sustainable and tangible business value. Why is the project aimed at supporting BAME young Londoners? The youth unemployment rate in London is significantly higher for 16-24 year olds compared to those aged 25-64. Research shows that in addition to lacking work experience as most young people do; those from BAME groups can face additional challenges such as low confidence levels, a lack of role models, and negative perceptions of job roles and their prospects. Employers on the other hand often have insufficient insight and capability of addressing this, resulting from utilising traditional recruitment channels and progression processes which are often not accessible or taken up. As a result, young people from BAME backgrounds generally face high levels of unemployment, low levels of career progression, and are subsequently at high risk of poverty. In addition this project will also address the current gender imbalance in the transport sector and engage more young females from BAME backgrounds, particularly to raise awareness of the variety of roles available to them. How does this project help make a difference? This project goes beyond a ‘job start’ and beyond the assumption that a job is a sure way of avoiding poverty. 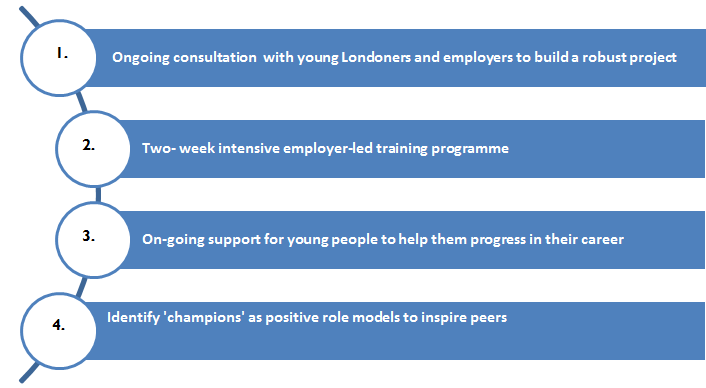 Mayor’s Fund for London supports young people regularly once they are in work, to help keep them in employment, and to ensure that they are aware of the opportunities available to them and how to access them in the future. A core component of the “En-route to Sustainable Employment” project is establishing key learning points. Throughout the two-year project the Mayor’s Fund for London will share relevant learning and project research that provide context and practical solutions. A focus on learning helps identify factors that strengthen the project and practical ways for employers to modify their recruitment practices and ensure that young people feel supported throughout the recruitment process and whilst in work. The learning will be used to create a practical model to help employers successfully recruit young people from BAME groups into the transport sector and ultimately to replicate this model across other sectors as well as other cities. The project is built around consultation with both young people and employers involved in all stages from planning, to delivery and evaluation. Young people were involved in the planning stage of this project, including taking part in a focus group. Some interesting experiences and opinions were shared, including practical suggestions for employers. See here for notes from the session.